TimberWest and Island Timberlands have signed an affiliation agreement to share corporate services and coordinate forest planning, while continuing as stand-alone companies. In other Business news: NAFTA shifts to Canada as the US and Mexico are close to a deal on autos; China proposes tariffs on US pulp from recycled paper; US construction costs hold steady in July; and FPAC makes its 2019 pre-budget pitch. On the wildfire front: California, Oregon and Ontario say progress is being made; but BC reports that two northern fires have merged; new fires are popping up across south; and wildfire crews are bracing for a shift in the weather. Finally, an historic wooden church in Russia is destroyed by fire; and two Canadian experts say wildfires will only get worse unless we learn to live with them. The Frogs will be here Monday only next week—unless there’s breaking news. Canada’s ambassador to the United States said he doesn’t see any reason why a new North American Free Trade Agreement can’t be renegotiated quickly, as long as all sides want it to get done. …MacNaughton expressed optimism that negotiations could pick up steam if the U.S. and Mexico reach an agreement on automotive rules at their talks in Washington this week. Bloomberg News reported Wednesday that the two sides are targeting an agreement on cars by the end of this week. …However, MacNaughton reiterated that the contentious sunset clause proposal and the need for a dispute resolution mechanism remain Canada’s greatest concerns in reaching a new deal, flagging the former as a major driver for investor certainty. 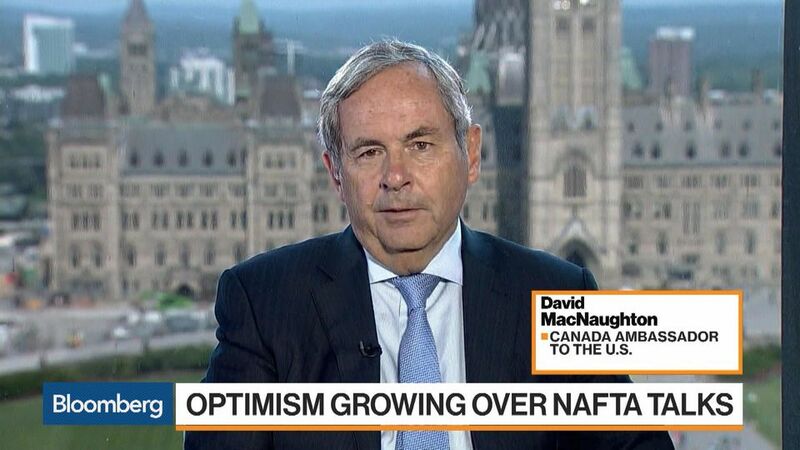 …MacNaughton also said that Canada’s diplomatic relationship with the United States remains strong, despite Trump’s recent tariff tactics. OTTAWA, – Forest Products Association of Canada (FPAC) has shared with the federal government its recommendations to enhance Canadian competitiveness, accelerate innovation, and ensure future forests remain healthy in its 2019 pre-budget submission to the House of Commons Standing Committee on Finance. To support family-supporting jobs in rural and northern Canada, and to ensure a vibrant Canadian forest products sector for tomorrow, FPAC is calling on the federal government to support key investments in research and development and the commercialization of new technologies, continue with its aggressive trade diversification agenda, and to consider reforms to secure a healthy forest for future generations. …”We have a working forest in Canada – one that provides real economic, environmental, and social benefits to our Canadians,” says FPAC CEO Derek Nighbor. Two forestry companies that control huge swaths of Vancouver Island have signed an affiliation agreement. TimberWest and Island Timberlands announced Thursday an agreement that will see them share roads and other infrastructure, align best practices and co-ordinate stewardship. According to identical press releases issued by the two parties, they will continue to be stand-alone companies with no change in ownership, but will share “corporate services.” TimberWest and Island Timberlands will share roads, sort yards and other infrastructure, “enhance forest health” by aligning stewardship and silviculture practices, and share a “best practice approach to watershed, ecosystem, species at risk and visual quality management.” The companies say the affiliation will also improve safety outcomes and expand recreation access and trail connections. The existing owners of TimberWest Forest Corporation and Island Timberlands Limited Partnership have entered into an agreement to provide for shared use of facilities, align best practices and enhance forest stewardship. British Columbia Investment Management Corporation (BCI) and the Public Sector Pension Investment Board (PSP Investments) acquired TimberWest in 2011. BCI and investing entities managed by Alberta Investment Management Corporation have been limitedpartners in Island Timberlands since 2005. TimberWest and Island Timberlands will continue to be stand-alone companies with no change in control while sharing corporate services. No significant changes are anticipated to sustainable harvest levels, contractor and field workforce employment as a result of this affiliation. Both companies will continue to process logs to meet the needs of domestic mills. … “As affiliated companies, TimberWest and Island Timberlands can each do more to plan and invest for the future of a stable and competitive coast forest sector,” said TimberWest CEO, Jeff Zweig. China is proposing tariffs on U.S. pulp made from recycled paper, a material that has received recent attention as a potential export to China to replace recovered paper bales. The Chinese Ministry of Commerce last week proposed new tariffs on roughly $60 billion in imports from the U.S. The list includes more than 5,000 product codes, and a few have relevance for the recycling industry. …The new Chinese proposal contains four lists with tariffs levied at different levels, from 5 percent to 25 percent. The list of products to be hit with a 20 percent tariff includes “fiber pulp extracted from recycled paper or cardboard.” Multiple industry experts said that would cover any pulp produced from a recycled paper mill. …Fiber consultant Bill Moore told Resource Recycling recycled pulp shipments from the U.S. to China have been negligible in the past. BOSTON — The Americas’ boxboard sector is being jolted by China’s ongoing waste-paper import restrictions. These policies have created a fiber deficit of at least 6 million tonnes for China’s boxboard producers – a shortfall expected to sharply reduce Chinese exports. The ripple effects of these disruptions on markets throughout the Americas are explored by the World Boxboard Study: Americas, a study published today by RISI, the leading information provider for the global forest products industry. “China’s boxboard industry has been heavily dependent on waste paper imports from the US,” said Abdulla Zaid, RISI Economist for North American Packaging and co-author of the new study. “Much of its output was then exported back to the US market, but going forward, we forecast that China’s fiber deficit will reduce its market share. Also, much of the waste paper that would have been sent to China is now available for US producers, lowering their production costs,” continued Zaid. 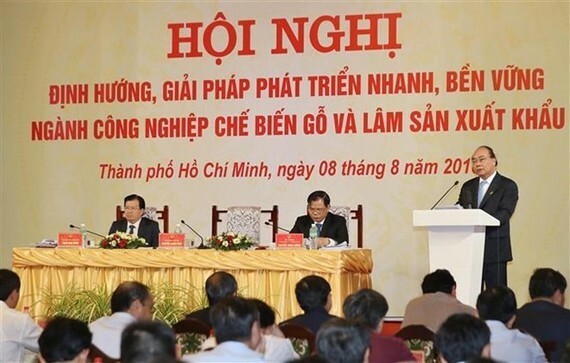 Wood processing and forestry export must become a spearhead in Vietnam’s production and exports in the next ten years, making the country become the world’s leading forestry production and export hub, said Prime Minister Nguyen Xuan Phuc. … the Prime Minister said that the sector should make tireless efforts to fulfill the target of 9 billion USD in export turnover in 2018, 10-11 billion USD by 2019, 12-13 billion by 2020, and 18-20 billion USD by 2015. It is necessary to draw up support policies for wood processing and forestry production establishments so as to realise the set goals and create more jobs in mountainous and rural areas. The Government leader laid stress on the sound implementation of the 2017 Law on Forestry, regarding forestry as a special technical economic sector in the value chain of forestry products from management, protection and development to forest utilisation, processing and trade of forest products. CORVALLIS, Ore. – The USDA will give Oregon State University nearly $500,000 to study the effects of moisture accumulation in mass timber and cross-laminated timber (CLT) buildings. The grant is an effect of the Timber Innovation Act, recently included in the 2018 Farm Bill. The Timber Innovation Act creates research and development programs under the USDA for mass timber, which includes CLT, glue-laminated beams, and laminated veneer lumber. The goal is to get mass timber to become an official construction material in U.S. building codes. Being absent in U.S. building codes leaves mass timber without a standard rating system for quality and safety. 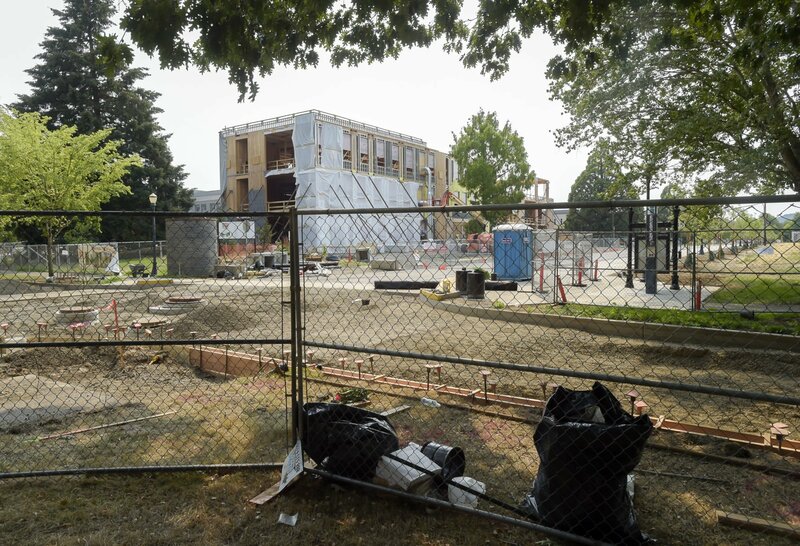 The need to replace defective cross-laminated timber panels has pushed back the estimated completion date of Oregon State University’s George W. Peavy Forest Science Center by another three months.“We’re looking at the fall of 2019,” OSU Vice President Steve Clark said this week.Meant to be a showcase for CLT panels and other made-in-Oregon mass timber products, the three-story classroom and laboratory building was originally targeted for completion in the fall of 2017, but that timeline has been repeatedly modified amid rising construction costs and other issues. The most recent setback began with a March 14 incident in which a 4-foot-by-20-foot section of CLT subflooring delaminated, causing two layers of the massive seven-ply panel to fall. No one was hurt, but construction was slowed as OSU brought in outside consulting engineers to determine what went wrong. The recent drought and heat exposure in B.C. has caused some Vancouver Island trees to show signs of stress. B.C. Forest Health Officer Tim Ebata says that most trees on Vancouver Island are pretty tough. “They have evolved with this type of weather for as long as they’ve been around,” Ebata told On the Island guest host Jason D’Souza. “But there are some species that are more susceptible to drought. And what we are seeing are trees that are actually dying.” On Vancouver Island’s east end and on the Sunshine Coast, many people are expressing concern about red cedars in particular, says Ebata. The tops of some trees are dying due to lack of moisture. Tree species that like wetter soils are susceptible to drying out, says Ebata. People can spot if a tree is responding to the drought. CANYONVILLE, Ore. — Logging and forest service crews play a big role year-round when it comes to fighting wildfires. Those crews have been cutting and burning undergrowth for decades. Doing so gets rid of the dead and dried out plants that fuel fires. Kyle Reed with the Douglas Forest Protective Association said the Stouts Creek Fire in 2015 was a great example of how getting rid of that undergrowth can help slow down these fires. 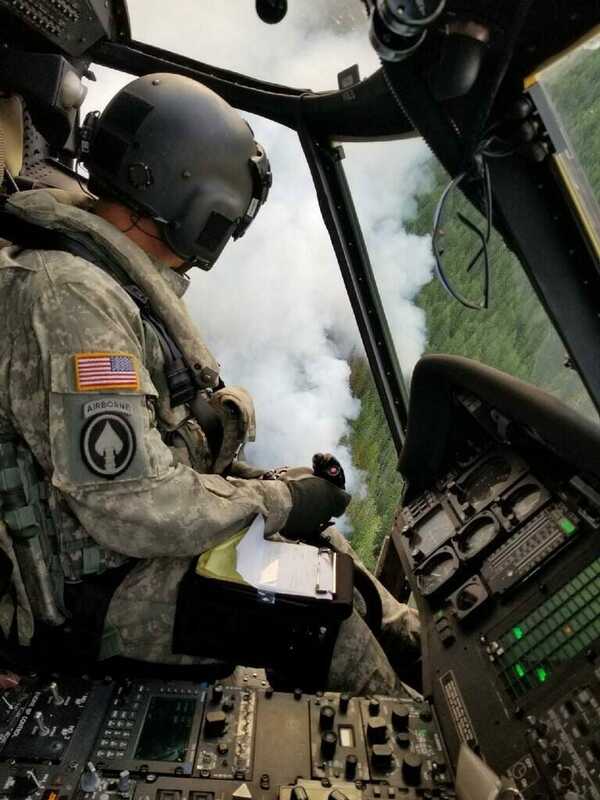 “We had some projects up there on the Umpqua National Forest a couple years before where we were doing thinning in different places, and we were actually able to hold the fire in those areas, where it was moving quickly in other spots,” Reed said. He said there’s a noticeable difference between thinned and overgrown areas. Wildfire activity and its impact are increasing around much of the world. …This is the reality and its coming was predictable even several decades ago. And, it will only get worse. The effort we put into adapting to this changed world will influence how easily we co-exist with fire. …As wildfire will remain a recurring feature in our lives, we have to learn to live with it. To live with it, we must understand it. We have to change our view of fire. It is not the enemy but just a natural process, one that has historically helped maintain many vegetated ecosystems. However, it is at times uncontrollable by even our modern technologies. …So as we face increased unmanageable wildfire activity in the 21st century, we need public investment (at both the provincial and federal level) in wildfire management and fire research to reduce this risk. 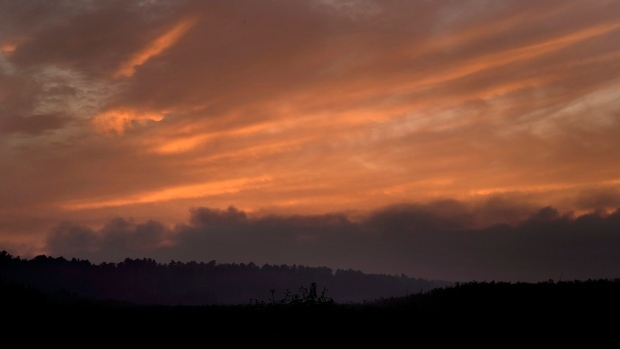 Wildfire crews brace for weather change as 39 new blazes recorded in B.C. More wildfires are burning in British Columbia in 2018 than in past years but the total amount of timber burned is well below average, a wildfire official says. “It’s very difficult to directly compare one fire season to another just based on the statistics alone, because the stats only tell part of the full story,” said Ryan Turcot, spokesman for the BC Wildfire Service. Across the province, 476 wildfires were burning Thursday, including 39 new fires sparked the previous day, while 1,565 have been recorded so far this year, well above the average of 1,130 expected by this point in the season, Turcot said. “In terms of area burned, we are still sitting at about 75 per cent of what the average would be for this time of year,” Turcot noted. … “But that doesn’t …factor in things like the human impact of wildfires, the proximity … to communities or to people and property,” Turcot said. Two large fires burning in northern B.C. have merged into one, now covering some 300 square kilometres near the Telegraph Creek area. The merged Alkali Lake and South Stikine River fires have so far destroyed 32 buildings in and around the Tahltan First Nation, with up to 45 per cent of the remaining buildings damaged by fire. “Most of the structures were family homes, both on and outside of the reserve,” said Chad Norman Day, president of the Tahltan Central Government. “It’s going to take years to rebuild what’s been lost, and it’s going to take decades for the land to be restored to where it was before, because we’ve lost a lot of forests.” Day’s own family ranch, which has been passed down generations, was damaged in the fire. “That’s been quite devastating for us, but at least our home is safe,” he said. As two major fires merged in northwest B.C. overnight, firefighters have had to contend with several new blazes that popped up in the southeast and the Okanagan region. Three significant new wildfires were ignited Thursday in the southeastern corner of the province, including a 35-hectare blaze just 10 kilometres from the Salmo-area site of the Shambhala Music Festival — an annual electronic music event that was threatened by wildfire last year. The B.C. Wildfire Service says the festival isn’t in any immediate danger this year, unlike in 2017, when its grounds were placed on evacuation alert. Large new wildfires are also burning northwest of Creston, within two kilometres of Highway 3, and northwest of Radium. 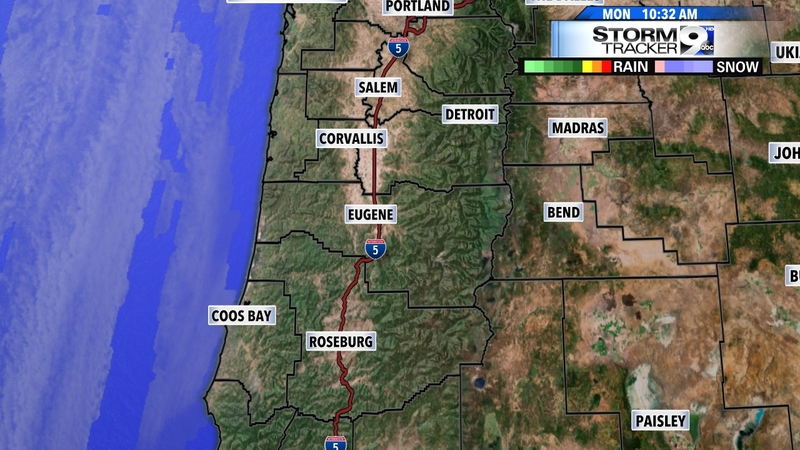 Two evacuation alerts have been issued in connection with the three southeastern blazes, including one for the McArthur Creek area, southeast of Salmo, and another for the Cross River/Nipika Mountain Resort areas. As firefighters battled a forest fire close to Horseshoe Bay Thursday, one local resident described the firefighting efforts as the hand of God releasing a ball of red over the blaze. Gleneagles resident Jody Lotzkar was on his roof taking photos of the fire that started Wednesday night and the aircraft fighting it, and said it looked like the aircraft had a fist with an arm attached to it and the hand opened, dropping a ball of red – fire retardant – onto the fire. … On Thursday, there were 15 fire fighters on the ground as well as helicopters and aerial tankers, said West Vancouver assistant fire chief Jeff Bush. Metro Vancouver Emergency Response was taking the lead on fighting the blaze. A forest fire that forced hundreds of people from their homes in northern Ontario is no longer considered out of control, according to the province. The Ministry of Natural Resources and Forestry said in a news release Thursday that Parry Sound 33, which is located roughly 100 kilometres north of the Town of Parry Sound, is now “being held.” The fire remains large – 11,362 hectares – but is now expected to stay “within the control boundaries that fire crews have established,” with continued use of water bombers and helicopters, the ministry said. Parry Sound 33 began in mid-July, forcing nearly 200 residents of Henvey Inlet First Nation to flee their homes. More than 400 people from the sprawling Municipality of Killarney were also ordered to leave. Henvey Inlet First Nation residents have returned home, and the ministry says it’s working to determine when other evacuees can safely return. UKIAH, Calif.— Firefighters said for the first time Wednesday that they have made good progress battling the state’s largest-ever wildfire but didn’t expect to have it fully under control until September. The blaze north of San Francisco has grown to the size of Los Angeles since it started two weeks ago, fueled by dry vegetation, high winds and rugged terrain that made it too dangerous for firefighters to directly attack the flames now spanning 470 square miles (1,217 square kilometers). 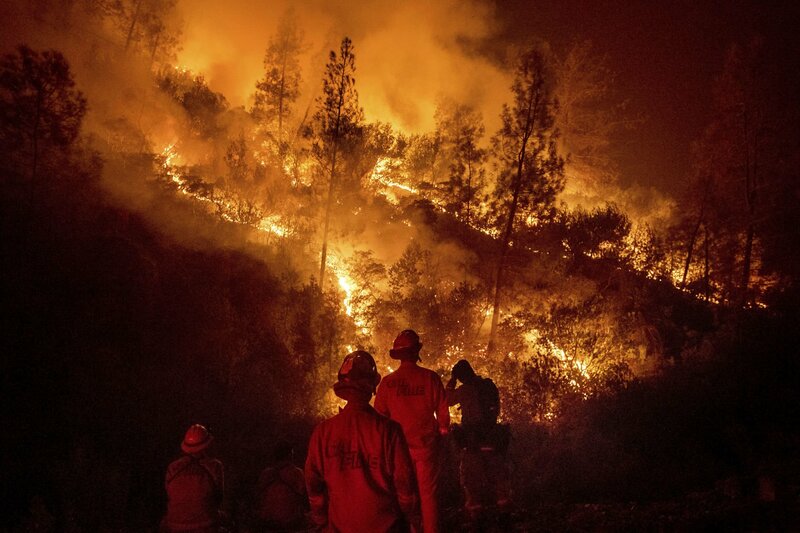 Crews, including inmates and firefighters from overseas, have managed to cut lines around half the fire to contain the flames, the California Department of Forestry and Fire Protection said. The blaze about 100 miles (160 kilometers) north of San Francisco around the resort region of Clear Lake has destroyed 116 homes and injured two firefighters. 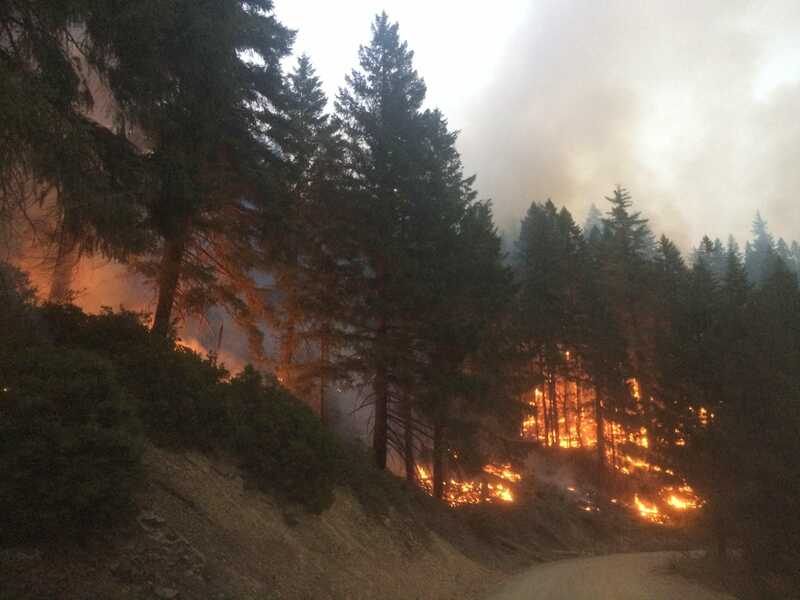 Fire teams were able to hold a crucial fire line on the Taylor Creek Fire Wednesday despite fire and “debris rolling downhill” toward Bear Camp Road. The largest fire burning in Southern Oregon, northwest of Grants Pass, grew to about 42,996 acres with 38 percent containment. The fire continues to stay within containment lines, at least for the moment, which is good news for the long-term outlook of a blaze that’s contributed to unhealthy air throughout the area. The northern flank of the fire — on Bear Camp Road — was considered a crucial battlefield and stopping the fire from jumping the road would be a victory. “It has been quite the firefight,” fire spokesman Kale Casey said. The Maple Fire — located 23 miles north of Shelton near the community of Hamma Hamma — has doubled in size since Wednesday and scorched more than 800 acres of heavy timbers. The blaze has created a heavy column of smoke in the air that’s visible from the Hood Canal and the surrounding areas. Crews have worked to prevent the spread of the wildfire since it was first reported on Saturday, however the fire’s remote location and steep terrain has posed some challenges to getting responders safely into certain areas where the blaze is burning. “It’s really hot, really dry and really rugged terrain,” said Maple Fire public information officer Norma Brock. The source of the fire is still under investigation, but signs point to being started by humans.